The SOUNDBOMBING series features some of the hottest underground rap artists gathered under one sonic roof. On the third volume, the bi-coastal collaboration of New York hip-hop producer Cipha Sounds and California cat Mr. Choc yields yet another impressive batch of tracks full of atmosphere and punch. While individual artists do have their spotlight moments here (Mos Def turns in a typically commanding performance on the murky but arresting “Freak Daddy,” for example), the collaborative spirit is encouraged and winds up as the reigning aesthetic. On “Round & Round Remix,” the melodic vocals of Jonell are offset by the tag-team raps of no less impressive a cabal than Method Man, Lool G Rap, and Pharoahe Monch. The spiritual concerns and transcendent vocal harmonies of Zap Mama are countered by the earthly interjections of Common and Talib Kweli on “Yelling Away.” Like its predecessors, SOUNDBOMBING III represents the inevitable forward motion of the hip-hop community, with East and West Coast crews eschewing rivalry in favor of the common good. 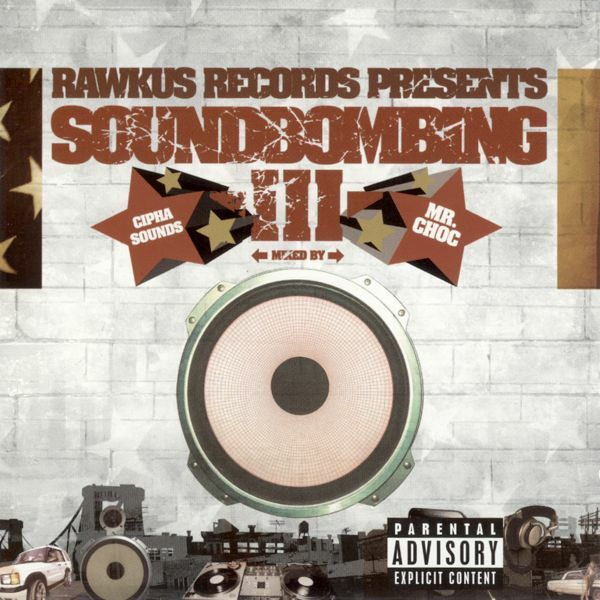 2 comments "VA ‎– Rawkus Presents: Soundbombing III (CD) (2002) (FLAC + 320 kbps)"